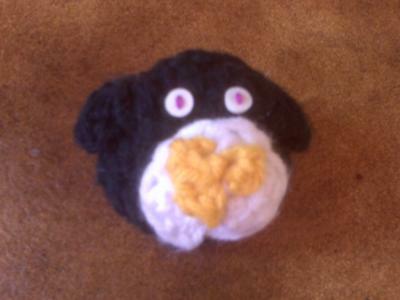 Here are crochet instructions for making a toy penguin! Materials: 4-ply yarn and a hook. I use a G hook, but gauge is unimportant. Note: I spiral, I don’t attach. Be sure to count at the ends of your rows! 1. Ch 2, hdc 4 times in 2nd ch from hook-4 sts. 2. (2 hdc) in each space around-8 sts. 3. (1 hdc, 2 hdc) around-12 sts. 4. If desired, continue increasing. 5. Hdc around until desired length-(12) sts. 7. Dec hdc around until down to 1 st.
1. Ch 5, hdc in each st across, turn-5 sts. 2. Skipping first and last st, hdc across-3 sts. 3. Skipping first and last st, hdc across-1 st.
4. Fasten off and sew to body. Make it a penguin: Make a black base, then repeat steps 1-3 in white. Sew on front before beak and face.